Crystallographic structure of the ligand binding domain of ROR? 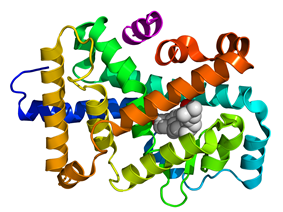 (rainbow colored, N-terminus = blue, C-terminus = red) complexed with 25-hydroxycholesterol (space-filling model (carbon = white, oxygen = red) and the NCOA2 coactivator (magneta). The mRNA of the first isoform, RORγ is expressed in many tissues, including thymus, lung, liver, kidney, muscle, and brown fat. While RORγ mRNA is abundantly expressed, attempts to detect RORγ protein have not been successful therefore it is not clear whether RORγ protein is actually expressed. Consistent with this, the main phenotypes identified in RORγ-/- knockout mice (where neither isoform is expressed) are those associated with RORγt immune system function and an isoform specific RORγt knockout displayed a phenotype identical to the RORγ-/- knockout. On the other hand, circadian phenotypes of RORγ-/- mice in tissues where the RORγt isoform is expressed in minute amounts argues for the expression of functional RORγ isoform. Absent protein in previous studies may be due to the high amplitude circadian rhythm of expression of this isoform in some tissues. RORγt is the most studied of the two isoforms. Its best understood functionality is in the lymph nodes and Peyer's patches, but not the spleen. RORγt also plays an important regulatory role in thymopoiesis, by reducing apoptosis of thymocytes and promoting thymocyte differentiation into pro-inflammatory T helper 17 (Th17) cells. It also plays a role in inhibiting apoptosis of undifferentiated T cells and promoting their differentiation into Th17 cells, possibly by down regulating the expression of Fas ligand and IL2, respectively . ^ a b Hirose T, Smith RJ, Jetten AM (December 1994). "ROR gamma: the third member of ROR/RZR orphan receptor subfamily that is highly expressed in skeletal muscle". Biochemical and Biophysical Research Communications 205 (3): 1976–83. ^ a b He YW, Deftos ML, Ojala EW, Bevan MJ (December 1998). "RORγt, a Novel Isoform of an Orphan Receptor, Negatively Regulates Fas Ligand Expression and IL-2 Production in T Cells". Immunity 9 (6): 797–806. ^ a b c Villey I, de Chasseval R, de Villartay JP (December 1999). "RORgammaT, a thymus-specific isoform of the orphan nuclear receptor RORgamma / TOR, is up-regulated by signaling through the pre-T cell receptor and binds to the TEA promoter". European Journal of Immunology 29 (12): 4072–80. ^ a b Eberl G, Littman DR (October 2003). "The role of the nuclear hormone receptor RORgammat in the development of lymph nodes and Peyer's patches". Immunological reviews 195: 81–90. ^ Medvedev A, Chistokhina A, Hirose T, Jetten AM (November 1997). "Genomic structure and chromosomal mapping of the nuclear orphan receptor ROR gamma (RORC) gene". Genomics 46 (1): 93–102. ^ Medvedev A, Yan ZH, Hirose T, Giguère V, Jetten AM (November 1996). "Cloning of a cDNA encoding the murine orphan receptor RZR/ROR gamma and characterization of its response element". Gene 181 (1–2): 199–206. ^ Ortiz MA, Piedrafita FJ, Pfahl M, Maki R (December 1995). "TOR: a new orphan receptor expressed in the thymus that can modulate retinoid and thyroid hormone signals". Molecular endocrinology (Baltimore, Md.) 9 (12): 1679–91. ^ a b Huang Z, Xie H, Wang R, Sun Z (June 2007). "Retinoid-related orphan receptor gamma t is a potential therapeutic target for controlling inflammatory autoimmunity". Expert opinion on therapeutic targets 11 (6): 737–43. ^ a b c Eberl G, Marmon S, Sunshine MJ, Rennert PD, Choi Y, Littman DR (January 2004). "An essential function for the nuclear receptor RORgamma(t) in the generation of fetal lymphoid tissue inducer cells". Nature Immunology 5 (1): 64–73. ^ a b Liu AC, Tran HG, Zhang EE, Priest AA, Welsh DK, Kay SA (February 2008). Takahashi, Joseph S., ed. "Redundant Function of REV-ERBα and β and Non-Essential Role for Bmal1 Cycling in Transcriptional Regulation of Intracellular Circadian Rhythms". PLoS genetics 4 (2): e1000023. ^ a b Guillaumond F, Dardente H, Giguère V, Cermakian N (October 2005). "Differential control of Bmal1 circadian transcription by REV-ERB and ROR nuclear receptors". Journal of biological rhythms 20 (5): 391–403. ^ Preitner N, Damiola F, Lopez-Molina L, Zakany J, Duboule D, Albrecht U, Schibler U (July 2002). "The orphan nuclear receptor REV-ERBalpha controls circadian transcription within the positive limb of the mammalian circadian oscillator". Cell 110 (2): 251–60. ^ a b c Sun Z, Unutmaz D, Zou YR, Sunshine MJ, Pierani A, Brenner-Morton S, Mebius RE, Littman DR (June 2000). "Requirement for RORgamma in thymocyte survival and lymphoid organ development". Science 288 (5475): 2369–73. ^ Eberl G, Littman DR (July 2004). "Thymic origin of intestinal alphabeta T cells revealed by fate mapping of RORgammat+ cells". Science 305 (5681): 248–51. ^ Benoit G, Cooney A, Giguere V, Ingraham H, Lazar M, Muscat G, Perlmann T, Renaud JP, Schwabe J, Sladek F, Tsai MJ, Laudet V (December 2006). "International Union of Pharmacology. LXVI. Orphan nuclear receptors". Pharmacological reviews 58 (4): 798–836. ^ Akashi M, Takumi T (May 2005). "The orphan nuclear receptor RORalpha regulates circadian transcription of the mammalian core-clock Bmal1". Nature structural & molecular biology 12 (5): 441–8. ^ Gréchez-Cassiau A, Rayet B, Guillaumond F, Teboul M, Delaunay F (February 2008). "The circadian clock component BMAL1 is a critical regulator of p21WAF1/CIP1 expression and hepatocyte proliferation". The Journal of Biological Chemistry 283 (8): 4535–42. ^ a b Kurebayashi S, Ueda E, Sakaue M, Patel DD, Medvedev A, Zhang F, Jetten AM (August 2000). "Retinoid-related orphan receptor γ (RORγ) is essential for lymphoid organogenesis and controls apoptosis during thymopoiesis". Proceedings of the National Academy of Sciences of the United States of America 97 (18): 10132–7. ^ Dong C (May 2008). "TH17 cells in development: an updated view of their molecular identity and genetic programming". Nature Reviews Immunology 8 (5): 337–48.